A portion of the invite created for my upcoming solo art show. I’m glad there’s still a fair amount of time until my first solo art show since 1994. I’m going to need it. The Opening Reception will be on Friday night, March 3 – still more than 40 days away yet it seems much closer than that to me. Once I had heard that 1900 Park – Creative Space and Gallery was willing to give me a solo show, it sent my planning wheels into motion. That was back in early November which now seems like a long, long time ago. I knew that I needed to wait until after the new year came and went before pushing out in too big a way. But now that January is in its final week, it’s time to start ramping up the planning. Invites were created and a good deal of them have been sent out – but not all of them as my list continues to evolve. 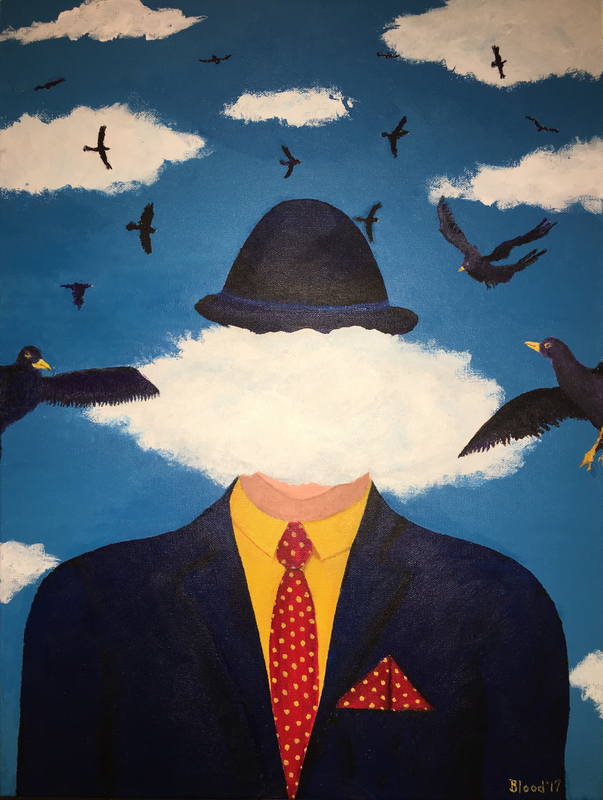 Since Tom Jr. is going to be the featured musical entertainment the night of the opening reception, we were initially calling the evening, “The Tom Blood Experience”. 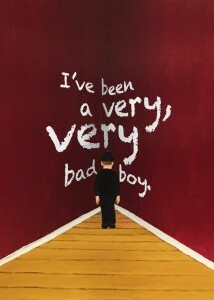 Though I liked the title, it didn’t quite seem right to me. Plus, the show will be up throughout most of the month of March and just calling my artwork ‘The Tom Blood Experience’ wasn’t making sense to me. 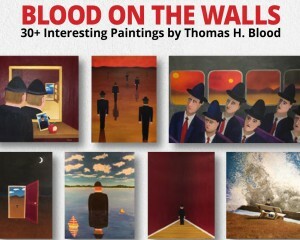 When you have a last name like mine, you might as well capitalize on it – thus ‘Blood on the Walls’ seemed to be an interesting and memorable name for a collection of my artwork that would be hanging on the walls. I intend to try and showcase some of the many objects that my art can appear on as well – pillows, iPhone cases, greeting cards, tote bags – the bright, colorful and often quite weird subject matter of what I paint just might be a good conversation starter. So I’ve ordered a number of items that we’ll have on display the evening of the event. Here’s a little card that a husband or boyfriend can send to their significant other as a means of apologizing. I wrote some copy for the insides that turns this into a pretty cool card and will have it on display at the show. 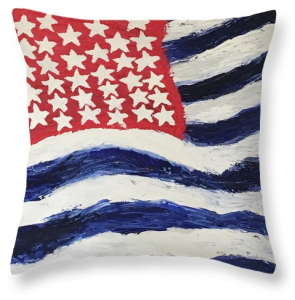 Something’s Wrong with America throw pillow. No, I won’t have this one at the show, but there will be another one that looks pretty cool. I don’t think that’s going to happen. Rather, it’s trying to figure out, “What if we have the show and everybody comes?” 1900 Park isn’t a huge facility. Still, I think they can handle a crowd and I’m sure they’ve had big turnouts before. So we’re trying to figure out a food and drink allotment and be ready for anything. Choosing which particular pieces I’m putting into the show remains a work in progress as well. There will be more than 30 paintings on display. Just how many, I’m still not quite sure. But each one will have a title, a price tag and a brief explanation as to what in the world I was thinking when I created it. I’ll provide some kind of explanation as to the meaning of this painting at my upcoming show at 1900 Park on March 3rd. There’s a lot more that’s going to go into this show. Tom Jr. has to work out his playlist. We’re ordering specially made t-shirts for the event (that will also be available for online purchase), There might be hand-outs and who knows what else. So as of now, time is on my side. I’m excited about the opportunity. And even though February only has 28 days, it’s going to be a long, long month.